Super welterweight world champion Erislandy “The American Dream” Lara (23-2-2, 13 KOs) will take on former world champion Yuri Foreman (34-2, 10 KOs) in a world title showdown that headlines Premier Boxing Champions on Spike on Friday, January 13 from Hialeah Park Racing and Casino in Miami. Televised coverage begins at 9 p.m. ET/8 p.m. CT with former super middleweight world champion Anthony “The Dog” Dirrell (29-1-1, 23 KOs) battling Hungary’s Norbert Nemesapati (24-4, 17 KOs) in a 10-round bout. The Cuban Lara will be making his fifth defense of his title as he heads to Miami to fight in front of the many Cuban boxing fans in the city. The consensus best fighter at 154-pounds, Lara will be challenged by an experienced Foreman, a former 154-pound champion in his own right, who has fully recovered from physical ailments that almost derailed his career. Now, Foreman looks to establish that he can still challenge at the elite level as he prepares to solve the crafty champion. The 33-year-old Lara is a slick boxer with the ability to deliver punishment while taking very little of it in return. 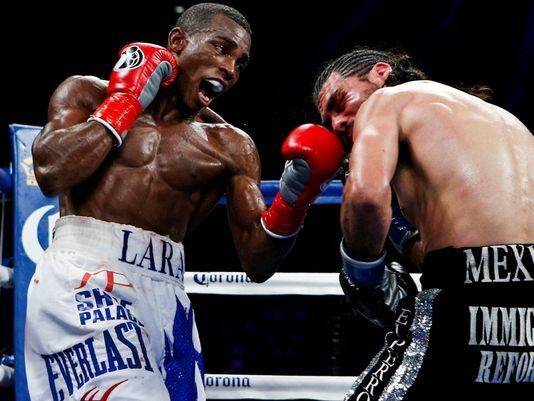 Lara has notched victories over Austin Trout, Alfredo Angulo, Ishe Smith and Freddy Hernandez. As an amateur, Lara won numerous titles including a national championship at welterweight, and also participated in the 2007 Pan-Am games. Originally from Guantanamo, Cuba, Lara dominated Delvin Rodriguez in June of last year and followed that up with a third-round stoppage of former champion Jan Zaveck. Most recently, Lara outclassed top contender Vanes Martirosyan in May in a rematch of their controversial technical draw in 2012. On January 13 Lara will make the fifth defense of his world title when he returns to fight at Hialeah for the second time. An ordained rabbi, Foreman moved to Brooklyn from Belarus at a young age and found solace inside the legendary Gleason’s Gym. Foreman was sensational in winning the first 27 fights of his career before he defeated Daniel Santos in November 2009 to capture a super welterweight world title. While he lost an all-New York showdown with Miguel Cotto at Yankee Stadium in 2010, Foreman won the last four fights of his career before retiring in 2013. Since deciding to return to the ring late last year, Foreman has picked up victories over Lenwood Dozier by decision and Jason Davis by second-round stoppage. Dirrell has seen more adversity than most throughout his career as his time in boxing has been seriously jeopardized twice, first in December 2006 when he was diagnosed with non-Hodgkins lymphoma and was sidelined for 20 months and again in May 2012 when he broke his lower left leg and left wrist in a motorcycle accident. The Flint, Michigan-native never let that hold him down as he kept winning fights and working his way up the professional ranks. In 2014 he won his first championship when he defeated defending champion Sakio Bika. His road back to a 168-pound title has seen him dominate former title challengers Marco Antonio Rubio last September and Caleb Truax in April. A pro since 2012, Nemesapati has already competed in 28 professional fights at just 21-years-old. The Budapest, Hungary-native won his first 14 pro fights and enters this bout on January 13 having won his last three matchups. He’s fought seven times this year, including a challenge of unbeaten Callum Smith in the UK in September before going on his current winning streak. He will fight in the United States for the second time in a professional career that has already seen him fight in six different countries. Haye v Bellew And Joshua v Klitschko – Which Is Your Preference?